I am always happy when I receive books and it almost always brightens my day. I am expecting a package next week that certainly will make me very happy, a Romanian publishing house made an almost unbelievable cost reduction and I got 10 books (some of them hardcover) at the price of a little more than 2 $ each. But here are some of my latest received books, although one of them I received it for some time now, but I haven’t got the chance to thank its sender properly until now. - "Johnny Gruesome" by Gregory Lamberson (through the courtesy of Gregory Lamberson). It was an act of bio-terrorism gone horribly wrong. A drug resistant version of the Black Death, an airborne mutation of the Ebola virus and the “Super Flu” were let loose on the world. Barely anyone survived. A year before the collapse, Grants Pass, Oregon, USA, was labelled as a place of meeting and sanctuary in a whimsical online, “what if” post. Now, it has become one of the last known refuges, and the hope, of mankind. 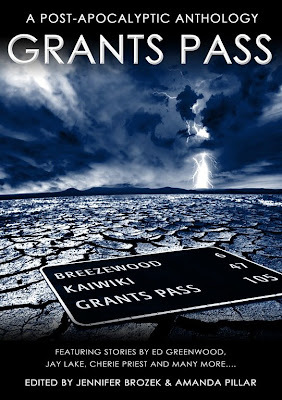 Also it looks like two stories set in the “Grants Pass” universe, “Warlord of Rhode Island” by Rick Silva and “Snake Oil” by David Priebe, will be released online prior to the official launch. The release date is already marked on my calendar. This July a much appreciated novel will see a reprint. 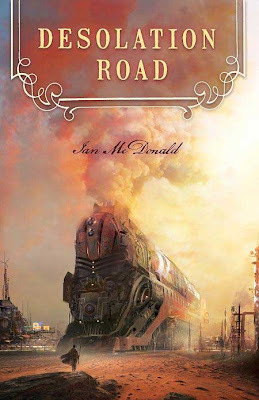 Ian McDonald’s debut novel, “Desolation Road”, published for the first time in 1988 will be re-published by Pyr SF. The novel was nominated for the Arthur C. Clarke Award and gathered many praising words since its first publishing. And as you can see the new edition benefits from a very interesting cover art, which to be honest would have caught my eye although I didn’t know the title or the author. 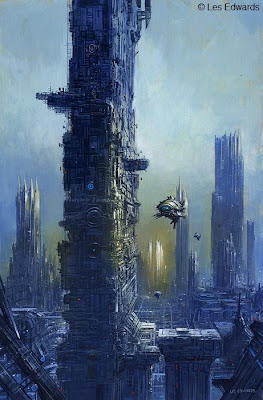 The cover was created by the multiple award winner and fascinating Stephan Martiniere. Thank you all once again and congratulations, Melanie! 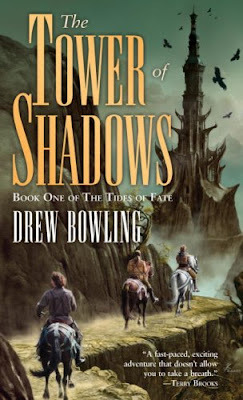 In a fantasy field of young authors dominated by Christopher Paolini and his “Inheritance” series it might be easy to overlook another young author, Drew Bowling, and his debut fantasy novel “The Tower of Shadows”. But I believe that every author deserves his chance and that’s the case with Drew Bowling as well. Fifteen years ago Corin Starcross was saved by Dale, a wizard, and Wren Tident, a mercenary, from a village attacked by demons, but his brother Cade remained behind. Now, Cade Starcross seeks revenge on the demon that killed his parents and for that he needs his separated brother. But his revenge affects the entire world and Dale and Wren have to save Corin once again from a tragic fate. 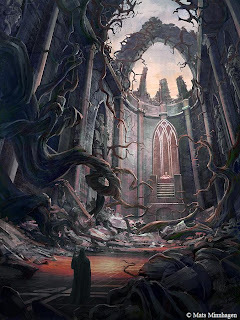 Drew Bowling uses in his novel “The Tower of Shadows” a plot and many elements which will be very familiar for the fantasy novels. The specific good and evil characters with their occupations, a retreated mercenary, an apprentice magician, a knight in search of good, an evil wizard, assassins involved in a story of revenge and the eternal battle between good and evil. But taken as a light and easy read, without exaggerated pretentions “The Tower of Shadows” is an action packed adventure. However, I have to admit that for a short (just over 300 pages) and light novel I had difficulties finishing it. 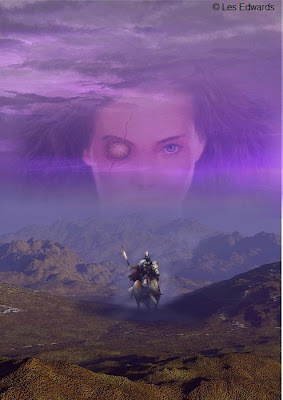 I am always interested in my fantasy readings in world-building and characterization, I like rich worlds and appealing characters, but these aspects fall behind in this novel, mainly because it is a short one and focused on action scenes. Because of Drew Bowling’s descriptions the world looks interesting, but faltered to captivate me more than the initial interest because it is not entirely developed. The religious aspect captured my interest at first too, but after the initial introduction it fails to come to attention again. In the same line with these aspects is the characterization, with characters that fail to entertain and that in many occasions sound untrue. For instance, Wren is a mercenary, but in many fighting scenes looks rather like an amateur than a seasoned fighter and he seems to have more trouble with humans than a particular dragon. Adriel is a young wizard who just finished his apprenticeship, but who doesn’t seem to know how to use magic and who is a boy defending a boy. When it comes to the main negative character he isn’t touched almost at all, without a proper reason behind his actions and motivations. I also have to say that despite all this Drew Bowling proves to have a talent for writing, creating some beautiful descriptions which capture the reader’s attention. Also on many places his author’s voice sounds more mature than it actually is and I mean that in the good way. I think that Drew Bowling made an effort in writing “The Tower of Shadows” which I don’t believe I would have made in my high-school years. I also believe that he has a lot of room for development and with the proper writing experience he can become an interesting author in the future. David Munoz Velazquez is a Spanish artist born in 1981 in Barcelona. 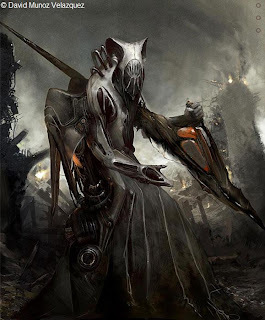 He studied Graphic design and he specialized in character and environment concept art. 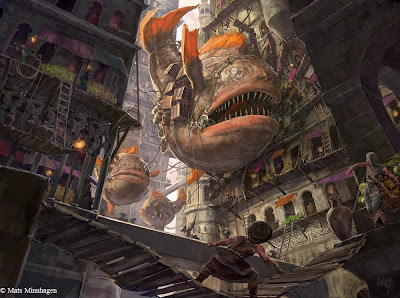 David gained experience in the video games industry as well and He was rewarded with several awards from the sites dedicated to digital art such as It’s Art, 3D Total, CGSociety and CGNode. 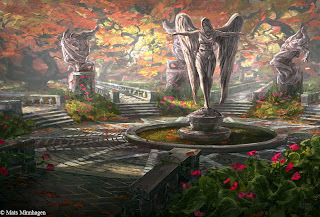 And the site Concept Art World compliments his work naming it, and I quote: “His artwork has hints of a Sci-Fi Dali”. Dark Wolf: David, thank you for this interview. How did you become interested in art? What was your first attempt to create your own art piece? David Munoz Velazquez: I think was watching cartoon series when I was younger (I’m still watching) I always like the fine artist, but I remember watching these canvas and thinking, that is a weird photo. My first attempt was copying the Transformers cartoons, Dragon Ball, etc. I don’t really remember the first one, I think was doing characters versions on the same style of the cartoons I liked. I could say it was when I learned more or less to use the Wacom tablet that gave me more options to practice colours and several things. Dark Wolf: Do you have any favorite artists? How did they influence your works so far? David Munoz Velazquez: Difficult question, most of the influence was from the movies, I always wanted to create images and characters like the ones I use to watch. I remember that Boris Vallejo, Ciruelo and a lot of other artists, but basically the ones I had access on comic stores and libraries. Lately I get influenced from things different from art. 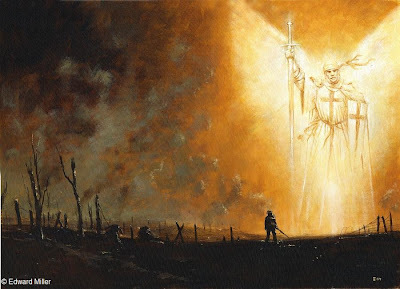 Today my favorite artist is Travis Charest, maybe is not the best one but to me has something special. Dark Wolf: What other influences did you have in your working experience so far? David Munoz Velazquez: As I said comic books, movies, fine art, architecture and also music, it is difficult to explain but in some way music gives me an attitude or inspiration, sometimes because the lyrics and other times from the rhythm. I believe that most of the time the influences are from very different things apart from art, at what happens to me. DW: I’ve seen that your portfolio is inclined toward character building and portraits. Do you prefer working on characters and portraits? DMV: My portfolio is mostly personal work, I work on environment at work so I rather do characters for fun. To me the most interesting thing is character design, most of them are just a design with a little bit of atmosphere to not leave it blank. Now I rather do character design or portraits on an illustration to make it a complete image not just a design. I like to work on both environments and characters, but I have a preference for characters. DW: Your characters make me think of Science Fiction. Does the Science Fiction genre influence your work? Do you have an interest in this genre beside art? DMV: Sure! I like practically everything about Science Fiction and Fantasy! I also have interest on astronomy and mystic themes. I like normal things also but I rather create things I would like to see and I can't. DW: I also noticed that not all your characters are entirely human and I could find a cross between humans and animals and characters and materials such metal and plastic. What inspires the creation of a character? Can such a character suffer changes from the inspiration point to the final point of creation? 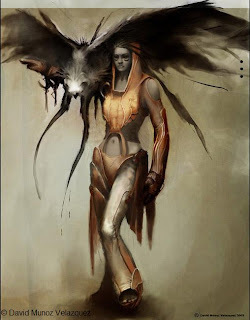 DMV: I really like the life forms that aren't sure what the body or what is armour or clothing, on some point I was amazed by the exoskeleton animal, which means to me that something that can look as armour or something weird is the actual body of the creature and is completely organic. I like to mix organic with solid and soft surfaces on the character... I just like it. That's the cool thing about improvising and I get quite a lot of freedom on shapes for a design that can change a lot and adapt while inspiration on some shapes appears and looks fresh or more interesting to me, plus I don't use to have an idea of what I'm going to create so, improvising is the base of my work flow, is slow but really fun. DW: Your characters seem to give the viewer a threatening perspective. Do you like to add your characters a dark and sober atmosphere? DMV: Yes! Absolutely! That doesn't mean I don't like it other way but that is my favorite. My parents use to tell me your characters look like bad guys but there is some solemnity that makes them be just weird and not that "bad". I think this gives them a different looking, even though being a bit dark or aggressive. I like characters without mouths or nose or eyes, that makes them show less feelings and I try compensating with something else as much as I can. DW: Also you work a lot with black and white, shades of black and white, light and dark. Do you think that a black and white piece can be more powerful than a colour one? How important is the use of light and shadows? DMV: I spend most of the time drawing with pencils, when I jumped on to digital painting I wasn't used to apply colour, so my first work was black and white and slowly I was introducing colours. Now, I start the painting with colours straightaway. Of course the use of light and shadows is basic at least to me to give a solid looking and gives depth and power to the image. 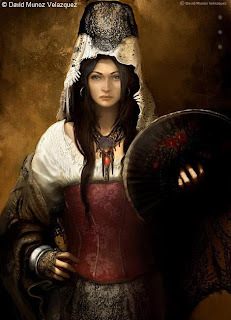 DW: One of my favorite works of yours, “Spanish Girl”, shows a careful attention to the details. How important are the minor details in a work and how do they contribute to the general perspective? DMV: I thing depends of the intention of the artist and also the style you want to use. To me is interesting to detail some areas and give other less detail or looseness, it looks less saturated of things and gives it more interest from my point of view. It is about making a focus on the things you want to show with more details. DW: Beside your character concept you have works in environment concept. From these ones do you prefer one more than the other? How much different is the process of creation when it comes to an environment? DMV: I like both, but I think characters are more interesting to me. Because in my jobs I do mostly environments I like to spend the spare time on characters. But as I said both things are interesting. For the creation things are quite different at least to me, for an environment can be more loose and I think has to be more interesting from colours, perspective, lighting, several basic things that has to come right just for the picture to look correct or believable, than the creative process that has to work at the same time. Also you can be more abstract creating shapes and spend more time refining details... to me it has differences but may be just the way I work on them. DW: You worked in the video games domain. How was working in this field? What new things did you learn working in the gaming industry? DMV: When I started my first serious job with Eurocom UK was working on environments, but until that time I was doing drawing and I did some small things on 3D. I learn pretty much everything about 3D and modeling, texturing and especially lighting which is my specialty. For lighting is interesting and difficult because the goal is that every view that the player can see needs to have an interesting lighting. Since a year and a half more or less I'm working on Kandor Moon which is a 3D animation studio, I'm doing basically lighting but on the movie industry I learn a lot of things, such high-poly modeling, compositing, matte painting and a lot of other things that are needed for films. DW: What would be a dream job or project for you? If it were possible in what past project involving conceptual art would you have liked to take part? DMV: I think my dream job would be modeling my own character and some others for a figure action or sculptures. 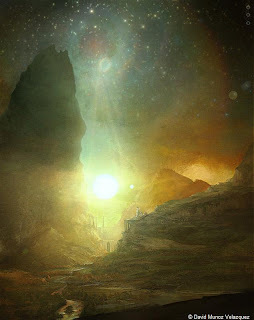 I also would like to specialize on matte painting, I'm still needing a lot of practice on that field. Thank you for the interest on my artwork and for giving me the opportunity to talk about it. It is my pleasure as well! 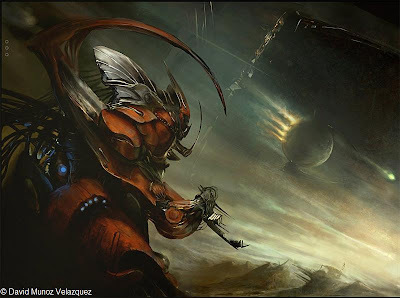 You can find many other works of David Munoz Velazquez and news about him on his website, munozvelazquez.com. The end of the 2008 and the beginning of 2009 didn’t let my mailbox go dry, to my great delight. So, I’ve noticed that my library is growing steadily and constantly and I’ve also noticed that my personal catalogue isn’t update since two years now (Larry's article made me notice this as well). I am thinking that the time has come for me to rearrange my library (although the space on my shelves seems to reach its limits) and updating my catalogue, but I have to take from my reading time and therefore I am undecided yet. - "Vampires in Vegas" by R.A. Lura (through the courtesy of R.A. Lura and Raular Publishing). Thank you all very much for these wonderful books! I have to say that the Fantasy, Science-Fiction and Horror genres are still at their beginning in my country. And they are not properly appreciated as well. Still, I am happy to say that the things are moving forward, now you can see many classic and new names reaching the book market in Romania. And with a strong community the future looks bright indeed. But if it’s a field where the things are moving even more slowly is the cover art. 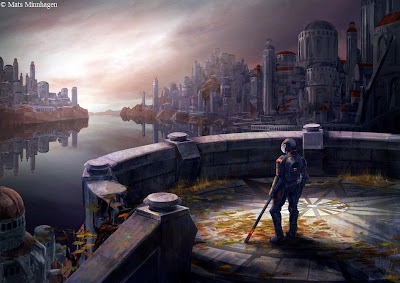 Unfortunately, the majority of cover art used in Fantasy, Science-Fiction and Horror genre are impersonal and stereotypical. Many covers use the same concept and although the art is changed a bit I cannot notice the resemblance with other books (usually released by the same publishing house) and the déjà-vu feeling they gave me. If I am not mistaken only one publishing house uses the original cover art, but not always. Until I discovered the cover you see above I was thinking at the publishing costs, but this release made me re-think the aspect. You see in Romania the books are pretty expensive. And if I talk about the hardcover editions I don’t know how many of the readers are ready to pay the price. To give you an example I personally prefer to use Amazon most of the time, because although I am paying a great amount of money on shipping costs I usually have an average price per outside book cheaper than the price of the Romanian edition. So I was thinking that they were cutting the costs of production from the cover art. 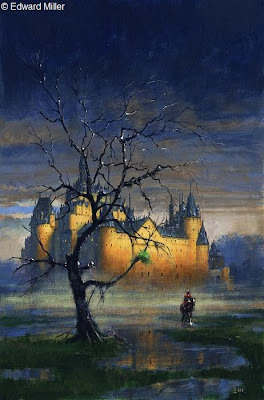 But the Romanian edition of Gene Wolfe’s “Lake of the Long Sun” published by Alexandria Publishing House proved to have the same price as many of the books on the market, but with an excellent cover art and with a superior quality in aspect. What impresses me even more is that Alexandria is a new publishing house on the market and “Lake of the Long Sun” is their only forth release. But if they keep their work on this standard I believe that they have a bright future ahead. The artist credited for the cover art is Mariusz Kozik and I hope I am not mistaken but I think he is a Polish artist nicknamed Lacedemon and who has some wonderful works on his website. 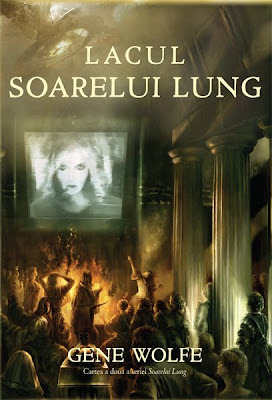 Anyway I think that this is one of best covers (if not the best) I’ve seen on the Romanian editions of Fantasy, Sci-Fi and Horror books and an example to follow by the other Romanian publishing houses. Under the harsh regime of an ambitious master, young Eon is training to become a Dragoneye, the human link to an energy dragon's power. His intensive study of Dragon Magic, which is based on the Chinese zodiac, involves two kinds of skills: sword-work and magical aptitude. Eon is lamed, and lacks the physical strength of his fellow trainees, but his unnaturally strong connection to the energy dragons helps him rise above the rest. In a spectacular sequence of events, Eon is thrust into the heart of a lethal struggle for the Imperial throne. In this new, treacherous world of hidden identities and uneasy alliances, Eon faces a vicious enemy who covets the young Dragoneye's astounding power, and will stop at nothing to make it his own. But Eon is playing a dangerous game: he is in fact Eona, a young woman whose true identity must remain hidden, for discovery would mean instant death. Inspired by the rich myths and traditions of Ancient China, shimmering with energy dragons, filled with dazzling swordplay and fraught with tension, this is a fast-paced, exhilarating page-turner. But that’s not all, the lucky winner will find that the prize includes two other books, Frank Beddor’s “The Looking Glass Wars” and Robin McKinley’s “Chalice”. To enter in the competition send me an e-mail at MihaiTheDarkWolf AT gmail DOT com (please replace the AT and DOT with the proper symbols) until Sunday, January 25th, with your name and adress, only one entry per person. The competition is open worldwide. I’ll announce the winner on Monday, January 26th. Jamin Winans' feature film Ink will have its world premiere at the 24th Annual Santa Barbara International Film Festival, which runs from January 22nd through February 2nd, 2009. Ink is one of only seven films in the independent features competition. This year the festival is honoring Hollywood powerhouses Clint Eastwood, Kate Winslet, Penelope Cruz, Kristen Scott Thomas and Mickey Rourke. Ink follows 8-year-old Emma, portrayed with excellence by Quinn Hunchar, through a mysterious dream-world. Dragged along by the mercenary Ink, colorful characters emerge to fight for Emma’s life. This fight also rages within Emma’s tragically broken father, played by the outstanding Chris Kelly, who must come to terms with his demons. Jamin is a 31-year-old writer/director living and working in Denver, Colorado. He established Double Edge Films there nine years ago and has made several critically acclaimed shorts and a feature film 11:59, which has worldwide distribution. His last short film Spin was the only film to win two awards at the 2006 Santa Barbara Independent Film Festival and went on to play over 80 festivals and bring home over 40 awards. Spin has 3 million hits across YouTube and has played on television in the US, Russia, Germany, France and Denmark. For more information, please visit http://www.doubleedgefilms.com/. The Santa Barbara International Film Festival is a non-profit organization dedicated to enriching local culture and raising consciousness of film as an art form. SBIFF presents quality American and world independent films, Latin American and Asian sidebars as well as documentary cinema within the beautiful setting of downtown Santa Barbara, a premier tourist destination. The SBIFF is also committed to education through its 10- 10-10 Student Filmmaking and Screenwriting Competitions, Field Trip to the Movies, and educational seminars. With a projected audience of over 70,000 viewing more than 200 films over its eleven-day run, the SBIFF attracts an affluent local and national consumer base, while maintaining strong ties with the entertainment industry in nearby Los Angeles. For more information, please visit http://www.sbfilmfestival.org/. Shaun Hutson is a well known name in the horror literature, but my encounters with his works are scarce. Still, when I had the opportunity to read his latest novel, “Body Count”, I jumped at it. Detective Inspector Joe Chapman and his team have to deal with another case, a series of murders made in a hunting game and into snuff movies posted on the Internet. But they are clueless and seem not to break the case. And Joe Chapman has to add to his working frustration another one from his personal life, his daughter ran away from home. However, a twist in his life will bring his problems to a new level. The novel starts in full flight, with a scene seen through the eyes of a victim. And after this initial scene the pace doesn’t slow down, on the contrary it picks a faster rhythm. “Body Count” kept me hooked in its action scenes, scenes that are present almost in every chapter. The novel is structured in short chapters and this adds to the pace keeping the reader caught in the plot. The action scenes are punctuated by gore and carnage, described closely to the smaller details and that might not be on everyone likings. But Shaun Hutson made the horror fan in me enjoy this gory scenes the most. Also described closely to the smaller details are the weapons, but that didn’t work for me that well. I mean that knowing a weapon and ammunition caliber is all right, but to keep reminding the caliber or going to the details of speed or range too often can turn off a reader from that particular scene. Another thing that didn’t sit well with me is the fact that some situations use clichés present in action movies and a few scenes are built as seen in those movies. However, these aspects are not used in excess and I could pass the inconveniences focusing on the plot and the action pace of the novel. What also helped me pass the inconveniences are the twists and turns of some situations. Although on some scenes I predicted an outcome the author came with a turn that was unexpected. When it comes to the characters of “Body Count” I have to say I felt rather neutral to them. They are built through the interaction with each other and through the immediate situations they face. But I have to ask myself if a more in-depth building of a character wouldn’t have faltered the steadily rising pace. The main figure is Joe Chapman, a policeman who doesn’t fit the general pattern of this type of characters. Shaun Hutson uses throughout the novel almost exclusively his last name and that didn’t help me either to connect to the character. But with Joe Chapman the author brings forth a few moral issues and a few interesting situations in which a man’s reactions would be hard to predict. 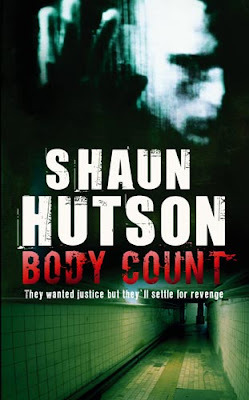 I believe that “Body Count” beside the gore and carnage present in its pages can work very well as high-paced thriller and I have to admit that Shaun Hutson’s novel was an entertaining and fun read for me. 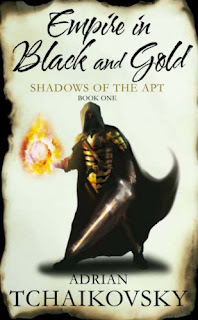 Adrian Tchaikovsky made his debut last year with the first setting in the “Shadows of the Apt” series, “Empire in Black and Gold”, an interesting novel with a captivating concept (my review). 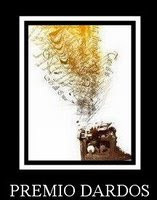 This year on 6th of February TOR UK will release the second novel of Adrian Tchaikovky’s series, “Dragonfly Falling”. If I am not mistaken the fantasy lovers and the series fans will enjoy this year the third novel of the series, “Blood of the Mantis”, as well, which is due to be release on 7th of August. Until then I had the pleasure and opportunity to make an interview with Adrian Tchaikovsky. Dark Wolf: What initial spark generated the idea of your story? And when did you decide to put that idea to paper? Adrian Tchaikovsky: The world of the insect-kinden has been bubbling away in the background since I first put pen to paper. I even used it as a role-playing game setting way back when I was at university. I’ve always had a fondness for insects, spiders and the like, which usually get the villain’s role in fiction. I wanted to produce a world where they were seen as, effectively, positive role models. Dark Wolf: Did you want to make a fantasy story since the beginning or have you thought at other genres as well? Adrian Tchaikovsky: It would probably be fashionable for me to strut my literary credentials here and explain how much of a very serious man of letters I really am, given the way the fantasy genre is so often maligned, but no: I’ve always wanted to write fantasy novels, and I’m not sure inspiration would come to me if I tried to force something else. 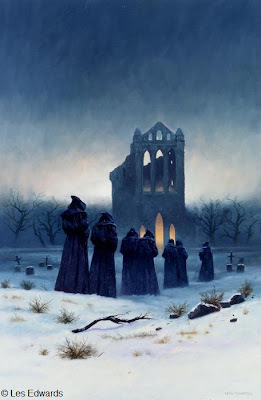 Dark Wolf: Do you find inspiration in other novels or fiction works? Is there an author who influenced your writing? Adrian Tchaikovsky: I read voraciously, and I’m sure that little nuggets of writing style filter through to me subconsciously all the time. However, my first published work was in the form of some stories for the old (and sadly now defunct) Xenos magazine. After three or so had hit print I had an epiphany, and my next story, which would have been in print in the issue immediately after the poor mag went bust, was leaps and bounds better than its predecessors. The change came after I discovered Peter S. Beagle, whose use of language, especially of imagery, is exquisite and beautiful. I learned a great deal from him about what one can do with words. DW: What difficulties did you encounter while writing your first novel, “Empire in Black and Gold”? AT: I had the ideas, the characters, the plot and the world easily enough. Probably the biggest challenge was one of scale. Previously I had written a single volume, usually known where a sequel would take it, but tried to get that one book into print on its own. And of course the sequels never got written because nobody took on book 1. With Empire I made the decision to get several books under my belt before letting the first volume see the light of day, meaning that I would invest a great deal more time and effort into a project that might, as I thought, do no better than its predecessors. Thankfully it all paid off. DW: I find your kinden idea, the humans possessing different insects species characteristics, original and interesting. Where did this idea come from? What researches did you make for implementing the insect characteristics to your characters? AT: I’ve been a keen amateur entomologist since I was young, and to me (quite unscientifically) insects have always had their own character and personality. It’s baggage I’ve brought with me, rather than something I’ve had to construct specifically for the book. This sounds weird to most people, I’m sure. Think of it like this: if the book had dealt with fierce tiger-kinden, nasty hyena-kinden and cunning fox-kinden, then nobody would bat an eyelid. These are the animal achetypes our culture is familiar with. I seem to have developed my own archetypes. DW: Do you see yourself as one of the insect-kinden presented in your novels? Would you tell me please which one it is? AT: Well it would be grand to be a sleek and deadly Mantis-kinden like Tisamon, but I probably rate as one of the poor bumbling Beetles. DW: The kinden in the “Empire in Black and Gold” can reach their insect characteristics using the “meditation”, but I found this concept not entirely developed. Will you try to explore and develop this concept in the next novels? AT: The Art of the kinden is very important to the long-term plot, and there will certainly be a greater explanation of it. However I won’t necessarily nail it down in black and white. Sometimes being too explicit about the “why” of things can rob the world of its essential appeal. It’s like a magic trick, when you know how it’s done. Part of the essential strangeness of the setting is that these Art abilities, even those as extreme as being able to fly, are absolutely normal to the insect-kinden, and not remotely “magical” (magical being something else entirely). DW: The insects are the most diverse group of animals on Earth and if I am not mistaken there are known over one million species. How did you decide which species are best for your story? With such a wide range of possibilities will you introduce new kinden in your story or will you remain at those already created? AT: Well you’re assuming that the series won’t run to over a million volumes, of course. My agent has said that he’ll quit when we get to boll weevil-kinden. Seriously, the kinden that appear in the stories are those insects that populate the mythscape of my own childhood most, and yes, there are many more to be introduced as the books go on. The world is vast and the kinden are many. DW: Beside the kinden idea you came with steampunk elements in your story. 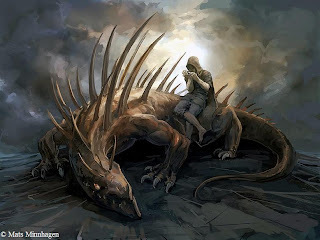 With these two ideas you proved that the fantasy genre can achieve new things. 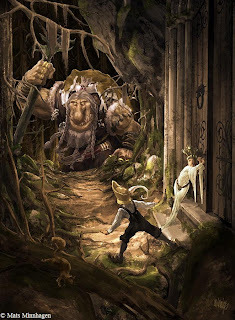 Did you want to bring something new to the fantasy genre and step aside the archetypes of this genre with these ideas? AT: You’re very kind. 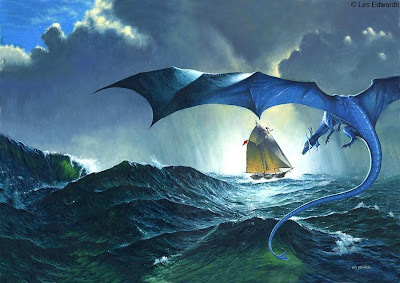 I wanted, and still want, to do something interesting with epic fantasy, whilst not divorcing the books from the essential features that epic-fantasy-readers look for. Hence the insects, and the artificers, but also hence a very careful selection process when it comes to the basic fantasy memes. 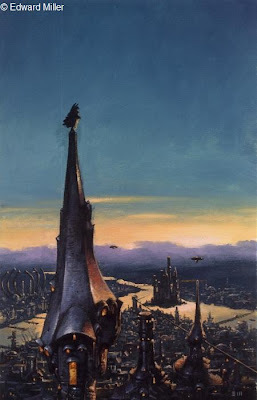 There are a lot of worn-out tropes in fantasy, and I’ve hopefully either avoided them, or given them a new spin (and so the Empire of the Wasps is neither as simple nor as black-and-white as your standard evil empire, for example, and its emperor (introduced in Dragonfly Falling) is not the Dark Lord one might expect). DW: On your site, Shadows of the Apt, you post a series of short stories set in the same world and building its history and the events in the novels. Do you plan to gather those stories in a separate volume or to integrate them in a future novel? AT: I’d certainly like to have a collection of short stories, and I’m hopefully going to have some third party shorts on my site soon as well. However, the publication on paper of a shorts collection is very much beyond my control at the moment. DW: These short stories are focused on the history of Lowlands and of your world. Do you still build your world and its history or these aspects were already created when you start writing your novels? AT: The world is constantly developing, and the shorts allow me to take a look at places that the main plot hasn’t been, to show what is happening in, say, the Dragonfly Commonweal. Many of the shorts follow up from incidents mentioned in the main text, or even provide prequel-style background material. The world is constantly being added to, but the amount I knew about when I was writing the first few books is larger than those parts seen through the window those books present. There are lots of places left to visit, and the shorts allow me to do that without needless digressions in the main plot. DW: Speaking of history of the world and as I mentioned before of the meditation process what new elements will bring your upcoming novel “Dragonfly Falling”? Would you reveal something from the upcoming novel? AT: We get to see a lot more inside the Empire in Dragonfly Falling – especially the higher echelons of the imperial court, and a lot of what really motivates the Wasp-kinden. We also get to know some of the Lowlands kinden in more detail, including the Mantids and Spiders, but most especially the Ant-kinden. 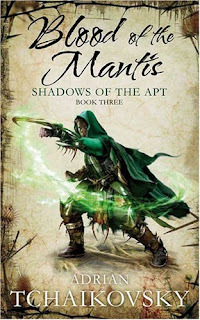 DW: Do you plan to finish your series with the novel “Blood of the Mantis” or it will be another novel or novels in the series? Do you have a precise end in mind for your series? AT: To let you into a secret, a few months ago I finished what now looks like it’s going to be book 6 in the series. I do have a precise end for the series, and I can promise that things will be wrapped up and that the kinden won’t end up dragging things out for the sake of it. However, the world of the kinden will still be there at the end, however marked by the events of the imperial war, and I already have a few inklings of where I may take it all afterwards, if people want me to. DW: What are your future plans? 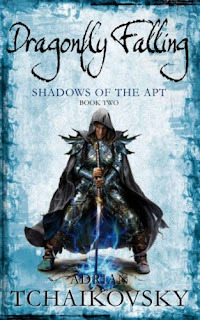 Do you have an idea about what you’ll write after finishing the “Shadows of the Apt” series? AT: The novel I wrote immediately before I started Empire has a lot of potential. It’s a kind of fantasy Napoleonic (although no dragons, so I’m not stepping on any toes) best described as Jane Austen meets Bernard Cornwell by way of Ursula Le Guin. I’m very fond of it, as a story, and I’d like to rewrite it a little and see it in print eventually. I have something of a hankering to write some far-future fantasy, dying earth stuff as well. For now, though, the kinden are the ones clamouring the loudest to get their story told, and so I’d better oblige them. Adrian, thank you very much for your answers and amiability. Farscape #1 is the first in a four issues series released by BOOM! Studios in the renowned universe of the successful Farscape TV series. The first issue is called “The Beginning of the End of the Beginning, Part 1: The Return of the King” and picks up the action from where the TV miniseries Farscape: The Peacekeepers Wars left it. John Crichton and Aeryn Sun are looking for a planet where to withdraw together with their son. On the other hand Rygel is looking forward to his return home and the retake of his lost throne. I found the setting and the action familiar and I believe that many of those familiar with the TV series will feel the same. However, the issue has a two pages introduction which will help those unfamiliar with the show enjoy the series as well. Farscape #1 builds the climate for the action packed issues that will follow. I say the action packed issues because I could see the story growing toward its high climax. Also the end of the first issue and the background story sustained by a mysterious figure that follows John and Aeryn Sun promise for the next issues action in Farscape style. The other thing which will make those familiar with the series feel right at home is the art. The drawings bring back the familiar characters and made me believe that I was still watching an episode of Farscape. The other drawings are attractive as well making a visual which pleased me and made me enjoy the comic a lot. The dialogues stand in the favor of the comic as well, with the amusing replicas and they give the same sense of familiarity as the action and drawings. 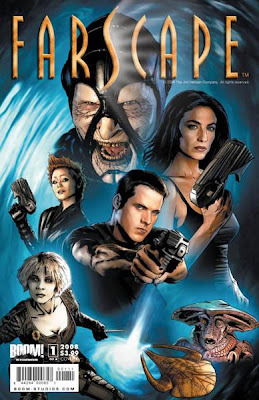 Overall, Farscape #1 offered me a pleasant reading and the same enjoyable time as the TV series. I’m certain that the rest of the series will not disappoint me and it will make me feel as the first issue did. The wonderful Tia Nevitt who runs the inspirational blog Fantasy Debut came up with a very interesting idea, a Book Blogger Convention. This idea captivated me immediately and I can only imagine how such a convention would look like. I am well aware that many book blogs owners know each other and have a constant interaction and I also know that the book blogosphere gives a sense of community, I sensed it since I’ve started my blog. I believe that such a convention will bring a lot of good things, meeting with each other, sharing opinions, difficulties and experiences, meeting with the readers, meeting with the professionals of the publishing, with authors or artists if they attend. However, as lovely as this idea is and as much support had received it encountered a problem. For the majority of us this is a hobby and each one loves what is doing, but we have a lot to cover besides our hobby, work, family, life in general, so many will not be able to attend do to various reasons. Also our community is covered worldwide and the participation to the convention will depend of this aspect too (and I have the feeling that many of us spend their savings on books ;)) But I will not lose hope and as my readings light up my imagination so is this idea, I dream of a future convention which will gather all the book bloggers. As I said the idea received wide support and now made roots. Maybe a real convention will not be possible soon, but why not start already in a medium we all know, Internet. So for starters we can attempt to build the convention on a blog started by Tia, Book Blogger Convention, and on a forum started by Mulluane, The Dragon Federation. I’ll try to attend both of them as much as my time allows and I will keep dreaming of the day when I’ll attend the real convention. 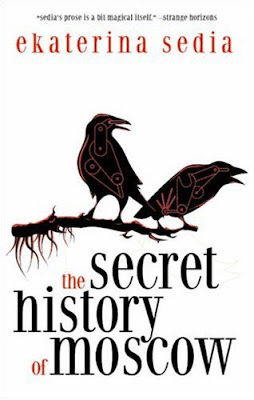 "The Secret History of Moscow"
Ekaterina Sedia made her debut with the novel “According to Crow” and “The Secret History of Moscow” is her second novel, one set as the title says in the author’s city of birth, Moscow. Galina lives in Moscow with her mother and her pregnant sister, Masha. When Masha gives birth to a baby boy in their apartment bathroom and mysteriously disappears Galina believes that her sister transformed in the jackdaw which seats at the bathroom window. But Galina was hospitalize for schizophrenia and she hesitates to share her believe with anyone. Instead she begins the quest to find her sister, a quest that leads her on the underground of Moscow together with her new acquaintances Fyodor, a street artist, and Yakov, a policeman. Among the stories I grew up with I was delighted by quite a great number of Russian fairytales and now Ekaterina Sedia through her novel, “The Secret History of Moscow”, made me remember those wonderful stories. In her novel Ekaterina Sedia brings to life some of the characters of the Russian folklore and legends, some historical characters and creates a few characters of our modern times, with the problems of the modern society and of the historical changes suffered by the Eastern European countries. The main characters of the novel are three misfits, each one of them with a sad story behind, but who seem to find their places in their unique stories and on the underground of Moscow. Ekaterina Sedia works masterfully on her characters and this applies not only to the main three characters, but to the other ones as well. Through the interaction and the conversations between the three main characters and the denizens of the underground Moscow the author introduces the reader to the stories of each character and to their more or less tragic destiny. Also through their stories the author takes the reader through different periods of the Moscow history and to some of the major events of this history. Besides the moments of history presented by Ekaterina Sedia she builds a wide picture of modern Moscow and the city situation after the fall of USSR and of the European communist bloc. I could connect with many aspects of Moscow present situation, because my country passed and still passes many of the same situations described by the author. The atmosphere created by the author is a grim one, but it is a captivating atmosphere. And the mix of history and mythology of the past Moscow adds new elements to the created atmosphere and to the pleasure of reading. Although the story seems to falter from time to time and to be overpowered by the character presentation on some places it is an original and attractive story. Adding some amusing situation and replicas in the story (my favorite one being that when Father Frost says: “Have you dum-dums ever noticed that the moment there’s a foreign invasion, you get a record cold winter?”) I was attracted by Ekaterina Sedia’s “The Secret History of Moscow” since the beginning and the novel introduced me to an author I’ll be watching in the future. It seems that Dark Wolf’s Fantasy Reviews got another award to my great surprise and delight. This time is “Premio Dardos” and was received from the very wonderful Christiane Below who runs a blog, Legolas Perlenuniversum, dedicated to her beautiful bead work. If she doesn’t sound familiar I have to tell you that she is the wife of one of the most frequent commenter on my blog, EdiFanoB, and who is a wonderful friend and a reader as every blogger wishes to have. Thank you very much! The award "Dardos" appreciates the merits - culturally, literary and individually- of every blogger who expresses him/herself on his/her blog.